Norway has never been part of the worldwide frenzy over modern Scandinavian flavors. 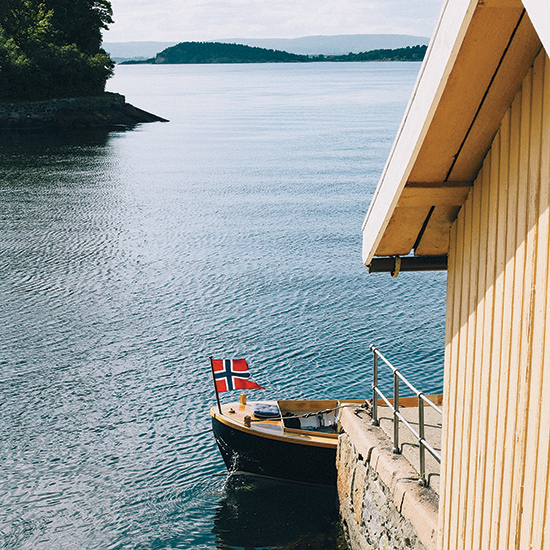 But when Tom Downey visits Oslo, he discovers an exciting new restaurant culture. I am not a chef,” Andreas Viestad says, for the fifth time since I’ve met him. As he speaks, he’s carefully stirring beets and barley in a cast-iron crock with one hand while plating sweetbreads with the other. I semi-accept what he tells me, but that willingness vanishes the moment I try his food. Not only is Viestad a chef, but he’s also a terrific one. He’s a famous Norwegian cookbook author and television host as well, and, generously, he has offered to be my guide to the fast-emerging Oslo food scene. In preparation, he’s cooking me dinner tonight at his house, located on a farm within an enormous city-center park. That property serves double duty as an educational center, where local children can learn about how food is grown, and, Viestad hopes, about a Norwegian farming heritage that’s quickly being lost. As I hear more about what’s happening both onthe farm and in Oslo as a whole, I realize that Viestad’s protests about not being a chef have a particular resonance. The New Nordic cuisine, as it is often called, has attracted worldwide attention in the past few years, but in a somewhat uneven way. Denmark has René Redzepi of Noma, a brilliant chef and internationally famous forager. Sweden has the acclaimed chef Magnus Nilsson, another obsessive forager, whose restaurant, Fäviken, has its own farm. Both nations also possess restaurant cultures that extend beyond these two big-name chefs. Norway, on the other hand, has neither a globally dominant superstar chef nor an abundance of restaurants that have drawn international attention. Redzepi and Nilsson are to some degree outliers—Scandinavia’s food culture is defined more by home cooking than it is by restaurants. And that’s especially true of Norway. Over the next few days, as I eat my way across Oslo, I begin to realize that this is why Viestad refuses to identify himself as a chef and why he seems so attached to Norway’s deeply local food sensibility and phenomenal ingredients. That strikes me as a good thing, because our global chef culture has its dangers. As chefs everywhere start to learn and cook together—as stagiaires, as participants in international conferences and other global exchanges, even through social media—they also begin to cook the same way. For me, the antidote to that globalization and homogenization lies in cooking that is extremely provincial (and I mean that in the neglected, and utterly positive, sense of the word). Oslo, as I explore it, is beguiling not because any restaurant here threatens to give Noma a run for its money, but because the city offers access to distinctive traditions that are unknown outside of Norway. He explains that the fruits and vegetables grown here, often in microclimates near fjords, have a flavor concentration and complexity that is impossible to match in more temperate places. As if on cue, we turn a corner and see a row of sidewalk strawberry vendors. “Taste these. You’ll see what I mean,” he says. They are tiny and dark red, perfectly ripe, the sweetest, deepest, most powerfully strawberry-tasting berries I’ve eaten in my life. When Viestad opened his restaurant, St. Lars, four years ago, it was hard to find Oslo restaurants that highlighted local ingredients rather than sauces or techniques imported from another place. But at St. Lars, the approach is simple: charcoal grilling the best ingredients in the country. My meal there was an edible illustration of Viestad’s philosophy. Grilled langoustines, plump and supremely juicy, were filled with that exquisite sea flavor I usually only find in shrimp heads. Crunchy fried pigs’ ears and snouts were a simple mid-course snack, and I finished with a grass-fed steak from a cattle farm near the city, perfectly cooked, served with minimal embellishment. Oddly, my first encounter with a Norwegian café was in Tokyo a couple of years ago, where the Oslo-based Fuglen had opened a Japanese branch (which, unexpectedly, had become radically popular with Japanese coffee fanatics). Now that I was in Oslo, I reached out to Halvor Digernes, a partner in Fuglen. Upon hearing what I was after, Digernes immediately suggested we meet at Smalhans, a newish restaurant in the St. Hanshaugen neighborhood, where we sat down to dinner with owner Anders Braathen. The place was buzzing, people standing two deep at the bar and packed into every available table. At Smalhans, the seasonal tasting menu changes weekly and is offered as an affordable five-course version for around $60 as well as a longer, more expensive one. The night I was there, a highlight of my meal was local salmon, bright pink, slow-cooked, served with potatoes flavored with fresh tarragon. But Smalhans has a significance beyond any single dish. It’s hard to get out of most restaurants here for less than $100 per person; Michelin-starred places might run $400 or $500 with wine. Building a real restaurant culture requires places where people can eat every day, and where chefs can work on the simpler side of their craft. Smalhans’s popularity makes it clear that Osloites want much more of what Braathen is giving them. Later that night, we explored Oslo’s flourishing craft-beer bar scene, which also proved to be a haven for some of the old-school dishes that are part of Norway’s heritage. At Tilt, a bar filled with people playing pinball and table shuffleboard just north of the city center, we sampled pølse med lompe, a hot dog–like boiled sausage wrapped in a round, tortilla-shaped potato pancake. Apparently, Norway has the highest per capita sausage consumption in the world, reputed to be more than 200 pounds per person per year. For my final night in Oslo, though, I put aside my obligation to keep up Norway’s per capita sausage consumption and instead visited one of Oslo’s newest Michelin-starred restaurants, Ylajali. The menu was sheathed in a copy of Norwegian novelist Knut Hamsun’s masterwork, Hunger; the restaurant’s name comes from one of the book’s characters. But as I looked at the tasting menu’s extensive list of dishes, which were supposed to mimic the arc of a novel, restaurant fatigue set in; the feeling that, no matter where I went in the world, I would inevitably find a chef cooking modernist dishes that tasted, smelled and felt depressingly like those on tasting menus everywhere. After I dove into chef Even Ramsvik’s food, I discovered that it has a distinctive Norwegian twist. I unwrapped the burned-black exterior of a leek to find the insides perfectly steamed and topped with a fine layer of pink fish roe and a hazelnut emulsion laced with crunchy nut halves. The most revelatory dish of the night—and of my entire Oslo trip—was also among the simplest: a spiky half shell of sea urchin, the bright orange slivers of roe topped with a thin layer of grated coffee bean. The combination was unexpected and totally perfect—but it wasn’t a dish that required avant-garde technique or fastidious preparation. Instead, all it demanded was an appreciation of the urchin itself, plus a mind open to surprising taste combinations. Perhaps, I thought as I spooned out the last of the urchin, instead of striving to outdo the unconventional ideas of a René Redzepi or a Magnus Nilsson, Norway can surprise the world in its own unadulterated way. Which might be exactly what restaurant-goers like me desperately want. Tom Downey writes for a variety of publications, including WSJ. Magazine, Afar and Smithsonian Magazine. He lives in New York City.